How much are residents earning in 2018, and are they satisfied with their earnings? How much debt do they have? More than 1900 residents in 29-plus specialties told us how much they earn, as well as the hours they work, how much scut work they have, and what their relationships with attendings, nurses, and PAs are like. All participants were enrolled in US medical resident programs. Average resident salary appears to be trending upward. Over the past 3 years, the average salary has increased by about 7%. The average salary for residents overall is $59,300. Among the highest-paying specialties for residents were allergy & immunology, rheumatology, and specialized surgery. In 2017, allergy & immunology, hematology, and nephrology were the highest-paying specialties for residents. Public health & preventive medicine and family medicine were at the low end of the pay scale this year. Average salary in the sixth through eighth year of residency was $64,300, a notable increase from the $55,200 received in the first year of residency. As expected, salaries increased with years of experience. Male and female residents earned fairly similar salaries. The earnings gap among physicians beyond residency was larger: Among primary care physicians, men earned 18% more than women, and male specialists earned 36% more. Over one half of residents in their first year feel that they are fairly compensated. "Resident compensation is wildly disproportionate to almost every other clinical staff member in the hospital," says Jacob Mirsky, MD, from Boston, Massachusetts, who just completed his residency in internal medicine (primary care). "Given how hard we work, how long we work, and how crucial our efforts are to taking care of patients, I think that resident compensation is woefully low. Although I felt like I was able to live comfortably during residency, the combination of marginal pay with the average educational debt of new residents close to $200,000 makes me think that there is a long way to go before residents are adequately compensated." Satisfaction with compensation is fairly similar among male and female residents. In 2018, more than two fifths (43%) of male residents and almost half (48%) of female residents said they feel that they are fairly compensated. Overall, more than half of physicians (55%) believe that they are fairly compensated. In 2017, similar percentages of male and female residents felt this way. Residents' chief reason for dissatisfaction is their feeling that compensation doesn't reflect the number of hours worked. Over two thirds of residents are unhappy that their compensation isn't comparable to that of other medical staff, such as PAs and nurses. One resident commented, "Compensation doesn't account for the amount of debt burden." Another resident said, "Thirty years ago, when my dad was a resident, he made $46K per year. It's silly that I am only making $8K more, which doesn't even keep up with inflation and the always increasing cost of living." Almost one third (31%) of residents said they would like to cash a paycheck that is 11%-25% larger than their current one. This finding is unchanged from 2017. In Medscape's Physician Compensation Report 2018, 45% of physicians said they would like to earn 11%-25% more, while another 32% feel they deserve a pay hike of 26%-50%. Over four fifths (88%) of residents receive health insurance. Fewer employers are providing professional liability coverage; 61% of residents are receiving this benefit now, compared with 75% in 2015. Of note, some residents receive nontraditional benefits, such as gym allowance, extra on-call pay, and cell phone allowance. In Medscape's Physician Compensation Report 2018, malpractice insurance and health insurance were cited by physicians as the most frequently provided benefits. Slightly over two fifths (41%) of residents indicated that future earnings are extremely or very influential in their specialty choice, compared with 38% in 2017. More men (46% vs 33% of women) said that future earnings are extremely or very influential. Still, not everyone is influenced by income. "Potential earnings do not play a part in my specialty choice," says Gregory Pelc, a third-year resident at Indiana University School of Medicine's internal medicine residency program. He has chosen to subspecialize in hospice and palliative medicine. Almost half of primary care residents said they plan to subspecialize, 40% said they will work in primary care, and 14% indicated that they will specialize but are still undecided about the specialty. These results are similar to last year's. Medical school debt is a significant factor in residents' lives. While almost one quarter of residents (23%) don't have any medical school debt, the same percentage have debt that exceeds $300,000. "I have about $100,000 in medical school debt. It's not a worry in the sense that I feel like it will affect my career path or choice, but compared with peers who chose other professions, physicians are at a significant disadvantage when it comes to planning for long-term financial security," says Pelc. 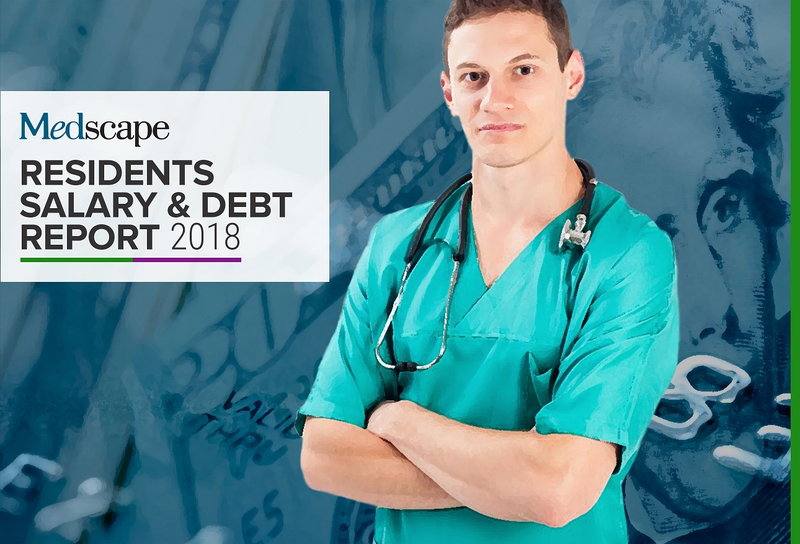 Almost a quarter of male and female residents have no medical school debt. Almost one quarter of both male and female residents have over $300,000 in medical school debt. Residents' schedules are quite rigorous. Over one third of residents (37%) are logging more than 60 hours per week seeing patients, while almost one fifth (18%) are spending 51-60 hours per week. Only 12% are seeing patients 30 hours or less per week. In Medscape's Physician Compensation Report 2018, over half of physicians (56%) reported that they spend 30-45 hours a week seeing patients. Residents spend most of their time at hospitals. Almost half (48%) spend over 60 hours per week, 20% said they log 51-60 hours per week, and 15% are at the hospital 41-50 hours per week. Over half (51%) of residents spend 1-5 nights on call per month, while 29% of residents said they log 6-10 nights per month. "There are many advantages and disadvantages to night call; some of the best learning takes place at night when multiple admissions come in and acute situations need to be handled with limited resources," says Mirsky. "However, the negative effects on sleep and social life are hard to play down. Overall, I had about 3-4 months of night call during my 3 years, which I think was very reasonable." Most residents appear satisfied with the amount of training they get. Slightly over one fifth noted that the hours are more than what's needed, and only 2% indicated that they have too few hours of training. Almost half (46%) of residents are performing 1 to 10 hours of scut work (defined as unskilled tasks) on a weekly basis. Over one quarter (28%) have 11 to 20 hours, while 12% are spending 21 to 30 hours a week on scut work. Most residents feel that they receive the appropriate degree of supervision. Only 7% of residents feel that they receive too much supervision. The majority of residents give a thumbs-up to their learning experience. Over three quarters said they are very or somewhat satisfied with their learning experience, while 12% are neutral in their opinion. Another 11% noted that they are somewhat or very dissatisfied with their learning situation. Most residents are satisfied with the way attending physicians treat them. A total of 81% are very or somewhat satisfied with their attendings' treatment. One resident, however, commented, "More dedicated teaching time would be appreciated." Others remarked: "I wish there was more hands-on instruction and supervision" and "There is not enough autonomy." Most residents have a good relationship with attending physicians, according to 90% of residents who described the relationship as very good or good. Only 9% referred to the relationship as fair, and 1% indicated that it is poor or very poor. Among those residents who don't feel that the relationship with attendings is good, one resident cited "lack of respect" while another noted "little mentoring." One resident mentioned "poor communication," and another commented, "They could be more supportive." Residents work closely with nurses and PAs. The majority (85%) of residents said their relationships with nurses and PAs are very good or good. The relationships are fair, said 13% of residents, and only 2% indicated "poor or very poor." "I'm very fortunate to have trained at a hospital that has wonderful nurses and PAs, and I can't say enough good things about the positive outcomes of working closely with well-trained and team-oriented staff," says Mirsky. Residents are open to using technology for patient consultations. Seventy-one percent said they would use video, such as webcam, or a similar technology. Over three fifths (62%) indicated that they would consult with patients by phone, 52% said they would have email consults, and 28% would text patients. These findings are similar to last year's. "I like being able to answer patients' questions and concerns from afar, though often I'm forced to answer that we can better address these at a follow-up visit when I have more time. There's only so much time one can spend sending emails and messages back and forth with patients," says Pelc. Overall, the proportion of self-employed physicians has been declining, and this trend is reflected in residents' future plans. Almost one third anticipate being employed as a non-partner/practice owner. "There is no question that my preference is to be employed," says Mirsky. "I have never once thought about owning my own practice, given the current healthcare climate and the anticipated changes coming down the pike in the coming decades." Gaining clinical knowledge and experience was cited as the most rewarding part of residency for approximately three quarters of both male and female residents. Gratitude and relationships with patients was mentioned by two thirds of male residents and almost three quarters of female residents. One resident found "finishing what I started" to be rewarding. "Being challenged mentally" and "job security" were other rewards that residents cited.